I am not very happy with the way that this schematic looks. I suppose that if I ponder it a while I can probably find a better way to visualize the circuit. This is the same basic circuit as what I posted last night using the Java simulator. base assuming that we are dealing with small signal parts. 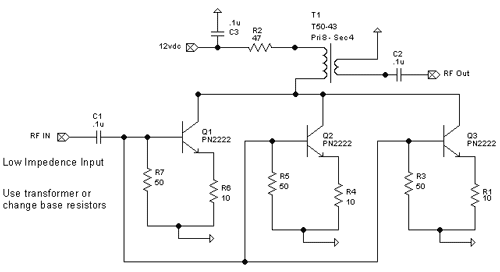 This circuit is designed to be driven with about +10 to +20dBm with the parts as shown. so T1 is used to match it to something in the 50 ohm range. "class A" this circuit would likely be extremely current hungry. but I had grabbed the wrong image. (above) about the input impedance. It was suggested that I could use three 150 resistors to get a Zin of approx 50 ohms. slightly better over all in the circuit with about 10dBm of input drive. slightly better over all in the circuit with about 20dBm of input drive.